In classical antiquity investigators provided clear descriptions of the great vessels but without understanding their role and function, particularly in the circulation of blood, so that their observations had limited relevance. They nonetheless recognized that vascular enlargements were pathological and dangerous, and the Greek surgeon Antyllos proposed an anatomically correct surgical technique for treating peripheral aneurysms. Knowledge stalled until the sixteenth century, when a new breed of scientists questioned the ancient authorities and replaced outdated knowledge through careful studies and new observations. A growing body of clinical observations and speculations about the mechanisms of disease eventually led to treatments using foreign material such as needles, wires, and electric current, aiming at stimulating inflammation and clotting to prevent rupture of the aneurysmatic lesion. New aneurysmal repair techniques known as endoaneurysmorrhaphy were introduced at the end of the nineteenth century, representing a major step forward in the surgical treatment of aneurysms. Further advances included fenestration in dissections and cellophane wrapping aimed at preventing growth. A new era in the treatment of aneurysms began in the 1950s with a shift from indirect (palliative) treatments to direct repair with excision and end-to-end reanastomosis, reconstructions, and use of venous grafts, homografts, and finally synthetic materials, of which Dacron proved to be the best. The evolution and routine clinical use of cardiopulmonary bypass, combined with (deep) hypothermia, circulatory arrest, and brain perfusion, were fundamental in allowing safe surgery on the aorta. 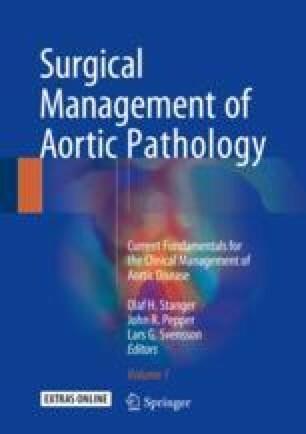 Among many other contributions, the development of conduit grafts, aortic valve sparing procedures, and (frozen) elephant techniques and the evolution of endovascular stent grafts profoundly transformed the surgical management of aortic pathologies, all supported by improved imaging modalities. This chapter intends to provide an overview of the history and evolution of aortic surgery from ancient times to the present, detailing the ongoing quest for improved aortic management. I wish to thank Genie Lamont (Graz, Austria), William Edwards (Curator, Gordon Museum, King’s College, London), Matt Nicholson (Hunterian Museum, The Royal College of Surgeons of England, London), Susan Y. Green at Baylor College of Medicine (Houston, Texas) and the librarians of the Josephina Library, Institute for the History of Medicine (Medical University of Vienna, Austria) for their valuable support.